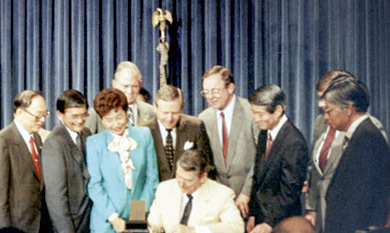 On Aug. 10, 1988, President Ronald Reagan signed into law the Civil Liberties Act of 1988, which granted redress of $20,000 and a formal presidential apology to survivors of the Japanese American concentration camps during World War II. The legislation, also known as H.R. 442, stated that government actions were based on “race prejudice, war hysteria and a failure of political leadership” as opposed to legitimate security reasons. In total, 82,219 survivors received redress payments. In recognition of this commemorative date, the Pacific Citizen presents in this issue a reprint of the original P.C. coverage of the historic event published in the Aug. 19-26, 1988, issue and written by former Editor Harry Honda. This issue of the P.C. also features on the cover the extraordinary artwork of longtime P.C. cartoonist Pete Hironaka. Created for the P.C. in 2000, the image, titled “The Nisei,” pays homage to important events in Japanese American history, including the passage of H.R. 442. In today’s ever-challenging political climate, this anniversary shows us how far we have come but how much further yet there still is to go.